distribution Essentially limited to the Coastal Plain, barely ranging into the extreme southeastern Piedmont, with an odd outlier in Burke County in the foothills. However, it is primarily found in the southern half of the Coastal Plain (including Sandhills), being of spotty occurrence north of Harnett, Wayne, and Hyde counties. Apparently absent in the extreme northeastern Coastal Plain. abundance Fairly common to common in the Sandhills; fairly common (to perhaps common) farther east in the southern half of the Coastal Plain. Rare to uncommon in the northern half of the Coastal Plain, and very rare in the Piedmont and the mountain foothills. flight A very long flight period, though less common after June. Occurs from early April to late October. 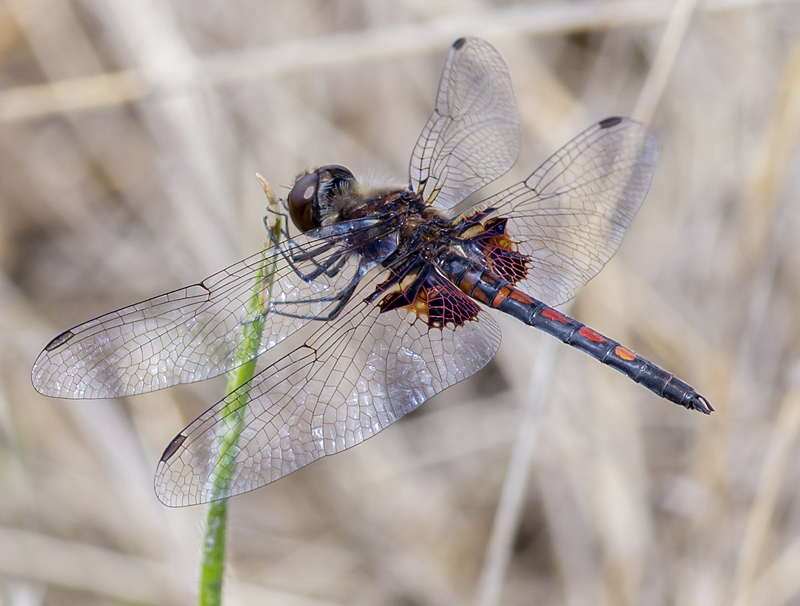 Its flight is earlier in spring than most of the other Celithemis pennants. habitat Ponds and smaller lakes, as with other pennants. These water should contain marshy or emergent vegetation along the margins. behavior Males are often seen around the margins of ponds, perching on twigs and making short patrols. Adults forage short distances from water, usually in sunny areas, such as fields, but not nearly as much as do Halloween Pennants. comments This species can be confused with Amanda's Pennant, and both may occur at the same ponds. However, Amanda's has a broader amber or reddish patch on the hind wing and typically forages much farther from water than does the Ornate Pennant; its flight averages later in the season. As with so many other pennants, the best strategy to see an Ornate Pennant is to walk around a margin of a pond, such as in the Sandhills or lower Coastal Plain. Beaton (2007) calls the species "Uncommon" in GA, but it is quite numerous in NC, mirroring Dunkle (2000), who says "common" across the range of the species -- TX to NJ. Comment: Scotland, 2015-05-08, Scotland Lake. - Mostly males.